A cookie is one of the most common ways to track a user on internet and maintain a user's session. Cookie is a text file using which you can store the information in user's browser and access it when you need it. This makes cookie one of the techniques to maintain a user's session and to differentiate a user from the others. You can even specify the duration for which this Cookie file is going exist before it gets deleted by the browser. Java Servlet Technology allows us to perform user's session management using its Cookie class. void Cookie(String name, String value) Constructs a Cookie with a name and a value. We can add cookie in the client's system by calling the addCookie() method of HttpServletResponse interface by using the response object. void addCookie(String name, String value) Adds a cookie within the client's browser. Some useful methods of Cookie class. The methods in the table below are part of javax.servlet.http.Cookie class, hence these methods are available to the object of Cookie class. void setDomain(String name) Sets the domain name which will be associated with the Cookie. String getDomain() Returns the domain name associated with the Cookie. void setMaxAge(int expiry) Sets the maximum time(in seconds) till the Cookie lasts. int getMaxAge() Returns the maximum time(in seconds) till the Cookie lasts. void setComment(String message) Sets a message/comment describing the Cookie. String getComment() Returns the message describing the Cookie. void setValue(String value) Sets the value of the Cookie that is already created. String getValue() Returns the value of the Cookie. We are creating a webpage which asks the user to enter the name and city and press the submit button, which when clicked calls the Servlet with the <url-pattern> SaveCookie, specified in the deployment descriptor file(web.xml), passing this Servlet the parameters named username and cityname, using default get method. create a cookie using the Cookie. Set a cookie, by calling a method addCookie() of HttpServletResponse's response object. Asking a user to click hyperlinks to read or delete the cookie, which was just set. Clicking on any of these hyperlinks will call the specific Servlet to read or delete the set cookie. This Servlet reads the cookie which was set by the first Servlet(MyServlet1.java). This Servlet deletes the cookie which was set by the first Servlet(MyServlet1.java). //but Cookie data will still be visible until you refresh this page. Project Folder - We have created a project folder named CookiesEx within the webapps folder of Tomcat installation folder. 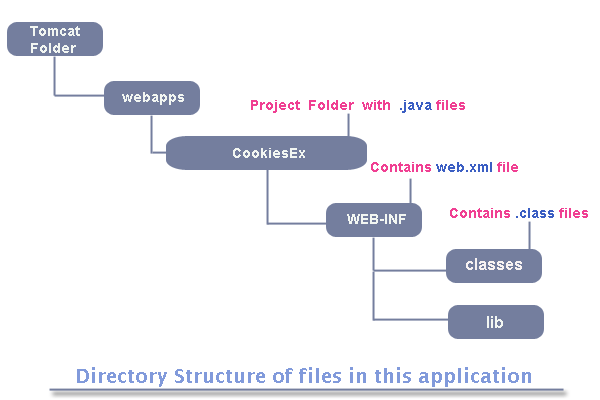 This folder contains the Servlet class(.java) file and WEB-INF folder. We are creating a webpage which asks the user to enter his/her name and city and press the submit button. On entering the details and clicking the submit button calls the Servlet with the <url-pattern> SaveCookie, specified in the deployment descriptor file(web.xml), passing this Servlet the parameter named username and cityname, using the default get method. Next, on clicking Read the Cookie link calls the Second Servlet which reads the cookie and displays the value present in this Cookie. First, by calling the setMaxAge() method of Cookie class and passing it a zero(0) in its parameters, which sets the cookie age to zero seconds. Next, by calling addCookie() method of response object deletes the cookie from the browser's memory, as shown below. Our Servlet(MyServlet3.java) deletes the cookie which was set by the first Servlet(MyServlet1.java). Let's go back to the same example and say - after saving the cookie, what would have happened, had we clicked the DeleteCookie hyperlink. Next, on clicking Delete the Cookie link calls the MyServlet3 Servlet with the <url-pattern> DeleteCookie as specified in web.xml. This Servlet deletes the cookie but the value in this cookie is displayed the first time this page loads. Next, on refreshing the page, the values associated with the cookie are not displayed because this cookie is deleted from the browser's memory.